Umbrellas and thatched gazebos keep your crew's noses and shoulders from getting too bright pink. Your championship title has been challenged (by a nine-year-old no less). Defend it. No mercy. Flip the burgers to perfection, then top yours just-so while the kids over-ketchup theirs. Cereal boxes out, bowls stacked, spoons handy. Keep it that simple. Even the desert can get chilly at night. Up the cozy factor by flipping on the fireplace. Remember that New Years' resolution you made? It's not too late to make it happen. The world-famous Strip is less than a mile away. The poolside sports bar has ten TVs to keep you up to speed on scores. You can't leave Vegas without seeing the Bellagio Fountains, just a mile away. Rotate 550 feet in the air on the High Roller ferris wheel, among the world's highest. A spectacle in a city of spectacles, the Wynn is a must-see – about a mile and a half away. Just one short block off the Strip, the Holiday Inn Desert Club Resort is surprisingly low-key for being so close to the storied Vegas action. Recent renovations and upgrades have this place looking spectacular, from the new game room and kids’ Activity Center to the poolside Gold Mine Bar & Grill. Grab a table indoors or al fresco for whichever meal you didn’t get around to actually making that day – it’s open for breakfast, lunch and dinner. The menu leans toward American sports bar classics, plus there’s a full bar and ten TVs to keep you up on the news and (more importantly) latest college and pro sports face-offs. (Look for the right hats and jerseys and park yourself near fellow fans if you’re really into it.) For the nights when you do have a game plan in place for dinner, nab one of the BBQs peppered throughout the property, and gather your crew around a table poolside. (Pick up sides at The Marketplace convenience store.) There are two fitness centers (one newly redone), and you’ll want to try all five heated pools and hot tubs before voting on a family favorite. Spacious one- and two-bedroom villas range in size from 510 - 1,490 square feet, and all are equipped with the essentials like full kitchens, plus some upgrades like stainless appliances. The in-suite washer/dryer helps you stay on your game with the laundry. And gas fireplaces make the living spaces extra cozy for movie nights, game nights or just hang-out-and-chat nights. Dining in Vegas is an event in itself. If you’re wanting to stay in the neighborhood, try nearby Lawry’s Prime Rib, the Fogo de Chao Brazilian Steakhouse experience, or Eiffel Tower Restaurant (with views of the Bellagio fountains!). 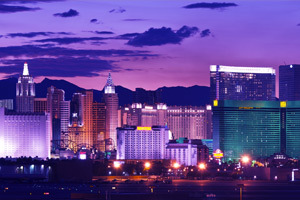 Spend your days hopping the complimentary shuttle, gawking at some of the largest casinos/resorts along the Strip or taking in the Fremont Street Experience. And while the onsite putting green is a great place to fine tune your short game, you’ll definitely want to head out to Shadow Creek, Bali Hai or more than 48 other championship courses for the real deal.